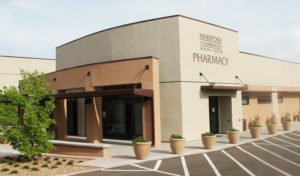 For added convenience, Mariposa provides a full-service pharmacy on the MCHC campus in Nogales. The efficiency of our on-site pharmacy has proven to be an extremely valuable asset to patients and Mariposa providers. And, as a benefit to our outlying clientele, the pharmacy makes daily prescription deliveries to the Family Health Center in Patagonia, Mariposa at Rio Rico and the Mariposa Tubac Regional Health Center in Tubac. Mariposa’s Pharmacy is now open on Saturday from 9:00 am – 2:00 pm! For more information, please call (520) 377-5417.